Unlucky book. It has a pretty unfortunate title for a YA book. A lot of people probably bypassed this book due to the fact it (coincidentally) sounds very similar to 50 Shades of Grey, a notorious adults-only book. But, it’s not the author’s fault. Between Shades of Grey was published a couple of months before 50 Shades of Grey. As far as I’m concerned, that gives Ruta Sepetys precedence. Too bad it’s not just me who’s concerned. This book is a gem but it’s one of those hidden jewels. It’s one of those books which are over looked. Not just because of the title, but also because of the content. This book is set in a camp during WWII but it’s not a Jewish concentration camp. The living standards of the people in here are almost as bad yet history knows nothing about them. Basically, the Soviet Union and the Germans made a treaty called the German-Soviet nonaggression pact which essentially allowed Soviet occupation of Lithuania, Latvia, Estonia, Bessarabia, northern Bukovina, and eastern Poland and German occupation. We all know that the Germans later broke this pact when Hitler got paranoid and decided to attack Soviet Union occupied territory (when will dictators ever learn that fighting a war on two different fronts is fatal) and the rest, as they say it, is history. But Between Shades of Grey focuses on the plight, the terror and the indignities suffered by the educated class of Lithuania when their country is taken over by the Russians and that is something that is often overlooked in history. They’re rehabitalized, treated as second class citizens, labelled as thieves and prostitutes and generally treated terribly all-around. . This book is desperate, sad and dark. For that reason, the cover is oddly fitting. The cover’s not just fitting for this book. It’s perfect. The snow and the barbed wire fits and sets the stage for all the cruelties and horrors featured in the book but it’s the small plant which symbolizes hope that is the crowning glory of the book. Small and not obvious, the plant is almost buried in the snow just like little snippets of hope are buried in the darkness and hopelessness of most of the book. 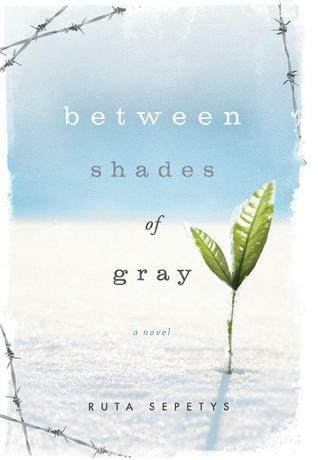 Between Shades of Grey has a plot so ugly it’s almost beautiful. Through all the indignities and tragedies Lina is forced to suffer, you’ll keep wanting to root her on and tell her it’s going to get better. But at the same time, you’re faced with the oppressive fact that it’s not. Not for a long time. I have not come across a world war 2 book which is as heart breaking and heart wrending as this one. And yes, that does include Code Name Verity by Elizabeth Wein, Diary of a Young Girl by Anne Frank and One Eye Lauguhing, the Other Eye Weeping by Barry Denenberg. Lina is a very strong and brave character. Right from the start she, she audaciously chooses to write about the terrible cruelties and the Soviets are doing to those around her as well as her family and herself. Lina is an artist, and she uses this talent to depict the gruesome scenes she’s forces to witness on a daily basis. She then hides her drawings where the NKVD (that’s the earlier version of the KGB), hopefully, won’t find them. In this she hopes that, one day, someone will find the proof of what really occurred, and make sure that it never happens again. But that’s not the only reason she draws. Separated from her father, she draws in the hopes that one of her pictures will make it’s way to him and assure him that she’s alive, even if she’s not safe and happy. She idolizes her mother, who is probably one of the most selfless, helpful and caring mother’s in YA and loves her brother. Her relationship with her family is one of the happiest and wholesome parts of the book. The romance in this book was under rated and it times awkward but it was innocent and sparkling throughout. Just enough to give hope. Andrius was an interesting character. He has so many faces. Angry (rightfully so) with the treatment of his mother. Caring, generous and playful with Lina’s family. And teasing with Lina herself. Intense all the time. A special mention has to be given to the writing. The sentences were short, succinct and definitely not flowery. And, really that’s the only way this book could be written. Somehow the shortness and harshness of the sentences contributed to the misery and darkness of the book. That being said, there were no euphuisms for what happened. Nothing cut short to spare the readers any of the horror or the pain. And it worked well that way. If Sepetys had used euphuisms for each horrible thing, this book would not be as hard-hitting. And if she had gone into long flowery tangents on how the narrator was feeling, I couldn’t have taken this book as seriously. Instead of getting descriptions of emotions I was forced to feel them instead. “He threw his burning cigarette onto our clean living room floor and ground it into the wood with his boot. I felt a little bit cheated with the ending but other than that this book was good. Really good. If you feel the need for a sad book with a little bit of hope or a good historical novel, then you need to pick up this book. If you don’t, you need to pick up this book anyways. This book is intense and maybe even life changing. This entry was posted in Book Reviews and tagged andrius, artist, Between Shades of Grey, characters, historical fiction, lina, Lithuiania, NKVD, ruta sepetys, soviet union, world war 2, writing, WW2, WWII, ya, young adult. Bookmark the permalink.